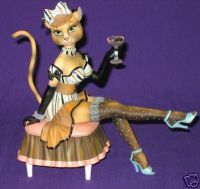 Little Priss Muffet | Alley Cats Standard Figurines | One Price Low Flat Shipping! From the Alley Cats Naughty Nursery Collection by Margaret Le Van, Little Pris Muffet (Daisy Doll). Made of hand-painted resin. Measures 5.5" tall. Manufactured by Artisan Flair. Brand new in original packaging. This alluring feline is sitting on a ottoman, one leg extended that shows off a stylish blue-dotted stockings, wearing low cut lingerie, with drink in hand! She's no innocent lil' meowess!!! Great Gift, Great Margaret Le Van Collectible. Brand new in original packaging.